In my collection of libertarian humor, my favorite item is probably the video mocking us for reflexive anti-statism. It presumably was put together by a statist, but I’ll be the first to admit that it’s very clever satire. Though if you prefer favorable humor, I very much enjoy Libertarian Jesus (featured here and here) because he makes a very serious point about the absurdity of equating government coercion with compassion (a lesson Pope Francis needs to understand). Today, I have an updated version of the collage I shared back in 2012. 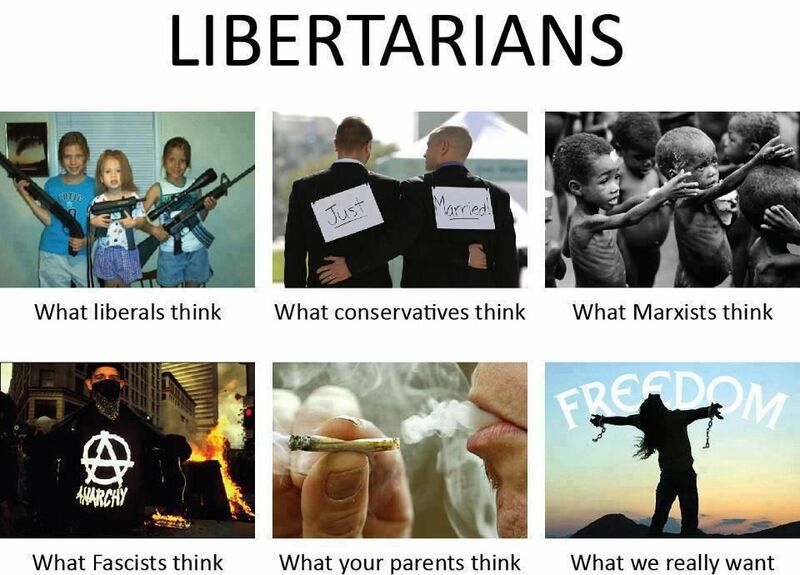 Here’s how the world see libertarians. Since I’ve taken my kids shooting (and raised them to have sound views), the top-left item has a good bit of truth. And there are some libertine libertarians, so conservative and parents aren’t being totally unfair in their stereotypes. I very much approve the lower-left frame because it mocks (I think) the totalitarians who want more government – even if they think of themselves as anarchists. Libertarian wonks understand what true anarchism is. Let’s close with a generic political joke. You start with a cage containing four monkeys, and inside the cage you hang a banana on a string, and then you place a set of stairs under the banana. Before long a monkey will go to the stairs and climb toward the banana. You then spray ALL the monkeys with cold water. After a while, another monkey makes an attempt. As soon as he touches the stairs, you spray ALL the monkeys with cold water. Pretty soon, when another monkey tries to climb the stairs, the other monkeys will try to prevent it. Then, replace a third original monkey with a new monkey, followed by the fourth. Every time the newest monkey takes to the stairs, he is attacked. Neither do they know why they are participating in the beating of the newest monkey. Having replaced all of the original monkeys, none of the remaining monkeys will have ever been sprayed with cold water. Why, you ask? Because in their minds, that is the way it has always been! from time to time, ALL of the monkeys need to be REPLACED AT THE SAME TIME! DISCLAIMER: This is meant as no disrespect to monkeys. P.S. If you enjoy generic political humor, I have several additional examples here.